The Culinary School at Eva’s Village was established in 2013 as a private vocational school certified by the Departments of Education, Labor & Workforce Development. 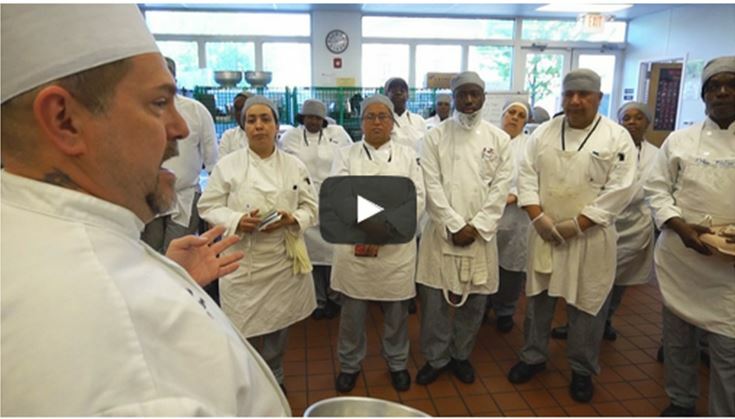 The focus of the six-month program is to train and place students in culinary careers. Financial aid is available. View our flyer. Students earn a certificate of completion and ServSafe® Certification. Students work their way through five modules, guided by Professional Chef Instructors in a state-of-the-art training kitchen. The Culinary School at Eva’s Village boasts a 92% job placement rate. Throughout the semester, students engage in work readiness exercises including resume building, interviewing and job retention skills. The best way to experience The Culinary School at Eva's Village is to visit our facilities. Complete the form below and Student Services will contact you to get your application started. We offer two, six-month sessions each year, beginning in January and June. We are now accepting applications for the June 2019 session.